Came down to my first Electrikhana today and WOW, it was amazing! So many people, many more than I though; lots of interesting manufacturer cars, custom cars and other non-car products on display. The test-drive line was never-ending, A HUGE thank-you to everyone that took their time to make this event possible, including all of the private vehicle owners taking people for rides and letting us drive their vehicles (how generous!) as well as all of the AEVA organisers, company displays, and everyone else. 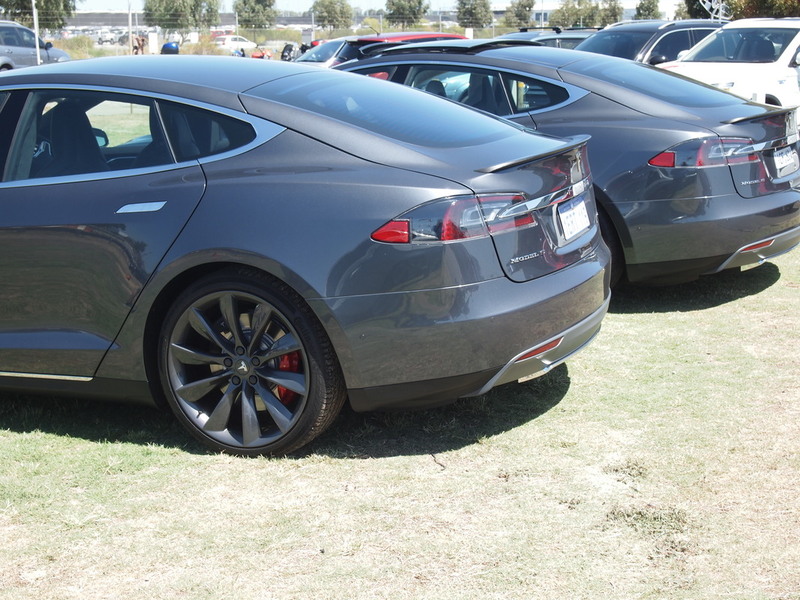 Personally I was able to go for a ride/drive in the Tesla Model S, Holden Volt, Nissan LEAF and BMW i3. I might take this opportunity to thank everyone from the Perth branch who came along and helped out today. We blew last year's numbers out of the water, with nearly 1000 people through the door and almost all of them getting a test-drive opportunity, and almost certainly a ride in a Tesla. I want to particularly thank Ant Day, Mitch Bisby and Richard Baird for all of the organising in the lead-up to Electrikahna. Michael Dent and Mark Winstanley must be thanked for spending so much time on the front line, getting sunburnt and losing their voices directing queues. Bruce Armstrong, Graeme Gordon, Graeme Eddington and Paul Wilson did an amazing job on the front desk checking tickets and taking door sales, while the RAC DTEC's James Shaw, who had only planned on being there for the morning but stayed all day, did a great job of making sure we had what we needed, when we needed it. Rob Mason, James Kunz, Steve Gates and David Langridge for working the barbecue, and fetching more supplies... twice! Our members who provided their own cars deserve special praise, especially Brian Mollan, Len Bunn, Joseph Law, Bruce Armstrong, Richard Baird, Frank Lister, Matt Kemner, David Lloyd and Marc Loveridge. Auto Classic BMW must be thanked for providing the static displays of the amazing BMW i8 and the i3, as well as a second i3 for test-drives. Massive thanks also to Daryl Robertson and Mark at Shacks Holden in Fremantle for providing a 2013 Volt for test-drives; it was out on the track all day thanks to the huge efforts of Leo Kerr riding shotgun. We're very grateful for Leah Worthington at Melville Mitsubishi to have sent a sales rep (who's name escapes me) and a PHEV Outlander which was easily one of the busiest queues all day. Sam Tomkins and Michelle Nazzari must be thanked for bringing their Zero SR and Fonarelli scooter respectively, ad offering up so many test-rides throughout the day. It's a shame we couldn't get more bikes and scooters out on track but the DTEC has rules about bikes and cars... Funny cause we ride with cars every other day. Rod Dilkes and Jamie from EV-Power kept it interesting with their electric go-kart, while Rodney DeBettencor made sure there was at least two e-bikes on ofer which could probably outrun a few of the cars! Epic, huge, fantastic effort by everyone - I suspect Electrikhana is now the biggest electric vehicle event in the southern hemisphere! Now, if Nissan Australia are reading this thread, which I doubt, but all the same you might want to pay attention. 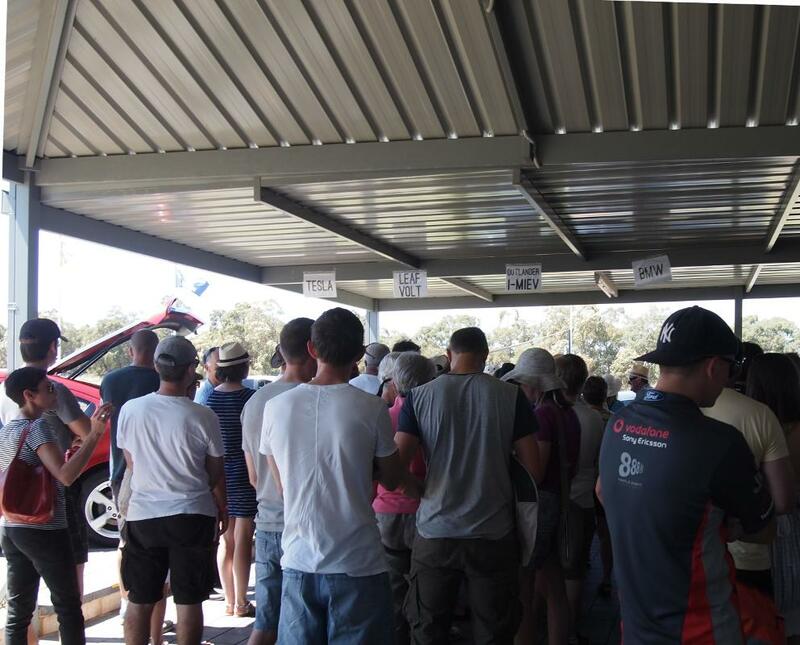 We had a thousand people turn up and pay $10 to test drive electric cars, of which there was only two Leafs, generously provided by private owners Brian and Len. There is a HUNGER for EVs in this country you simply cannot ignore. People have moved on from seeing electric vehicles as a quirky oddity to a genuinely viable option. Pull your finger out and start bringing in some 2015 Leafs! Ladies and Gentlemen, the electric transport revolution has not only commenced, but is so far advanced, oil might as well bow out. Get used to it, and get excited! Yes, thankyou to everyone for organising and running it. I offered to help but then kind of didn't. Thanks especially to Sam for letting me have a go on his Zero motorcycle. Fantastic to ride, though still about $20,000 more than I really want to spend. I had to leave at midday to do some solar powered flying (paragliding at York). Second it. Thanks heaps for organizer and contributors. Big leap compared to last year, and I was blown away already from last year. I'm surprised there are at least 4 Teslas already on the day (2 off them just being parked). One of the Tesla just got out on the parking lot on the west side, where the sand bank is. My car almost got bogged in the sand, but that Tesla, 2 ton of it, just glide through the sand. Awesome! Last edited by Rusdy on Mon, 09 Mar 2015, 05:55, edited 1 time in total. If anyone has photos or video, please upload them here. As always, I never had a chance to take a single picture, despite me bringing a Go-Pro with the intention of filming everyone's reactions to things like the Teslas and Voltron Evo. Some great photos are out there, so please, post them up! Oh, and I strongly suggest each branch does something like Electrikhana as a fundraiser and profile raiser. 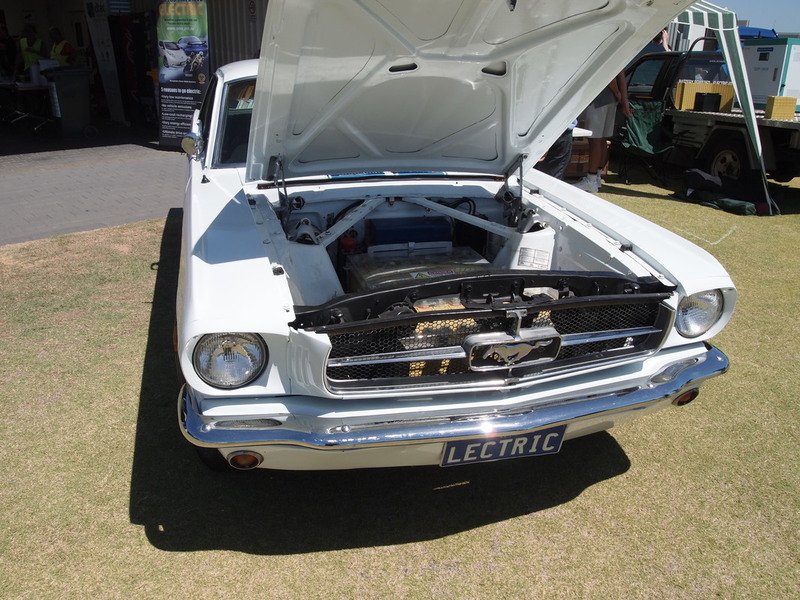 Thanks to Electrikhana, the Perth branch now has well over 100 members, and with this growing base we can bring about policy changes which make EVs accessible for the masses. Even if it's some other organisation's efforts, get behind it and get it out there. Nothing changes people's minds like a lived experience. I think I spent more than 6 hours behind the wheel, but I did manage to take a handful of photos. Great work to the Western Australia team, you've set the bar pretty high for other states now!